The enduring pull of folklore (in the broadest possible sense of the term) is not an easy thing to explain. Myths, legends, tales, traditions, fables, ballads and songs, not to mention all manner of rhymes, jokes, sayings and other titbits, have the ability to endure – that much is obvious – but quite why they endure so powerfully is not always clear. Individually, the place of a folktale or ballad in our contemporary collective consciousness can often be traced to a particular collector or singer or anthology, but why do we continue to collect them and sing them and put them in books, often hundreds of years after they first appeared, when our lives and communities are so different from those that gave rise to them? One answer is that folklore offers an experience that is at once deeply familiar and jarringly alien. Like most people, I have no particular connection to oral traditions. The majority of us did not grow up in rural storytelling communities, and aside from memories of children’s fairy tale collections we have little strong association with folkloric material of any kind. A personal connection to folklore, however, is by no means a prerequisite for a fascination with the subject. These are the stories and songs that belong to no one person. They speak to us in a language that we understand, even if we don’t always know why, and they tell us things we feel to be right and true, even if the content of the narrative has no modern analogue. They are deeply uncanny and strangely comforting, and I, like many, love them. Any act of collecting or preserving folk material risks accusations of patronising or misunderstanding traditions that are often intimately linked to a specific community, or of privileging a particular variant or source and thereby ossifying what should be a fluid and plural form. Despite this often valid criticism, there has been no shortage of authors and interpreters ready to make available folk traditions and to offer themselves as guides to the proliferating volumes of such works. The early folklore collectors spawned an interest in popular material that has never abated, and although a whiff of antiquarian fustiness occasionally jars with what is still a living tradition, the retransmission that is at the core of folklore and folksong continues. The Edinburgh Companion to Scottish Traditional Literatures, a comprehensive collection of essays edited by Sarah Dunnigan and Suzanne Gilbert, aims to take the reader through the history of traditional Scottish tale and verse. This includes not only the histories of particular texts and tellers, but also the individual and collective enterprises that sought to collect, describe, catalogue and transmit every kind of tradition. Many of the key figures in this history are familiar: Allan Ramsay, Robert Burns, Walter Scott, James Hogg, Hugh Miller, John Francis Campbell, Robert Chambers, Francis James Child, Hamish Henderson; however, this is not the story of any one individual, but rather of a people and the traditions that belong to them (whatever multiple meanings those terms may have at any given historic moment). The central matter of this book is prefaced with three essays, covering the core topics of genre, folk belief and transmission. These map out the ground, define the terms and provide an overview of the shifting politics of folkloristics. This allows the rest of the essays to progress more or less chronologically from the medieval period to the late twentieth century, offering a gallop through the highlights of Scottish traditions. Of these three scene-setting pieces, it is Lizanne Henderson’s chapter on folk belief that takes as its theme the first principle of Scottish traditional literatures – the vastness and depth of local and national superstitions that Scotland possesses, and the ways in which these superstitions have found their way into an uncountable diversity of songs and tales. In a country where every hill hides a fairy, every wood a witch and every lake a kelpie, it is the sheer fecundity of superstitions that allows such a corresponding profusion of folklore. In combination, the fifteen essays here build up a thorough and vivid picture of a history of a history: that is, the stories of the men and women whose endeavours have given us the body of traditional material in existence, and who built the tools we still use to help us make sense of it. Topics covered by the Companion include the vernacular Gaelic tradition; heroic Gaelic ballads; Lowland song culture; the folklore of the Highland and Islands; the eighteenth-century and Romantic ballad revivals; and the folk revival of the mid-twentieth century. This is a rich and valuable resource – one which may be dipped into to provide an accessible entry point to virtually any aspect of traditional Scottish life and lore. The combination of subject matter is nicely balanced, and it is easy to see how useful this volume will be as a route into an enormous and often daunting field. As an introductory frame of reference the Companion succeeds. What it does less well is provide a full picture of precisely what is being studied, collected and described. There are any number of anthologies of Scottish tales and ballads, and the task of this volume is not to replicate them. Nonetheless, the book deals with a vast expanse of material across genres, languages and centuries, some concrete examples of which (beyond the usual smattering of quotations) would no doubt be of benefit to the casual reader or the undergraduate student. There are ways of counteracting the fact that you are writing about texts your audience is unlikely to be familiar with – as several of the contributors demonstrate. Sarah Dunnigan’s chapter on the early modern period uses one central text – Wedderburn’s The Complaynt of Scotland – as a nucleus around which to build her discussion of the shifting exchanges between history and tradition, satire and sentiment that characterised the Scottish Renaissance. Katherine Campbell and Kirsteen McCue incorporate sizable chunks of lyrics and scores to help bring their subject of eighteenth-century Lowland song culture to life. Jason Marc Harris’s chapter on Highland and Island folklore in the nineteenth century takes a different tack, bringing his chapter closer to a formal reference article by using short, clearly demarcated sections to cover the ground. In other instances, where a less deliberate structure has been put in place, the results can be diluted into a series of accessible, useful but slightly bloodless summaries. This effect is exacerbated by the number of essays in the volume. Fourteen short pieces leads to a fair amount of repetition, and while the breadth of material demands expertise from disparate academic disciplines, the overall effect can on occasions seem cursory and rushed. Several chapters focus much of their attention on lists of key historical texts: detailed and valuable for the student, certainly, but without much room to explain why anyone should care to read those works now. Every contributor here knows their topic, and has no shortage of insights to share, but these can get lost in the efforts to cover the requisite amount of chronological terrain and in the need to summarise the works of the wise and worthy, at the expense of a richer analytical narrative. It is perhaps unfair to level this kind of criticism at an entry-level textbook. The Companion format – so popular at the moment – does not lend itself to the detailed exploration of a theme. The essays are likely to be read in isolation, as students browse for digestible expositions on a given topic, and the structure understandably tends towards a wide sweep and a summary of historical and contemporary issues. This can be a useful thing, but the danger is that debates are summarised over and over, without ever providing any conclusions or solutions. This can be exasperating, as contributors are left to repeat definitions, examples, quotes, aphorisms and to describe again and again the contributions made by key figures (how many accounts does one book need of the origin of the term ‘folklore’, or of the significance of Child’s work?). The editors are not unaware of this danger, and have bookended the volume with two rather more personal pieces by the scholar and folk singer Margaret Bennett. These sit outside the main chronological framework and thoughtfully explore folklore’s status as an ongoing, living tradition. From a practitioner’s perspective, Bennett describes the motivations of the overlapping groups of scholars and enthusiasts, singers and tellers, who have amassed vast quantities of traditional materials and sought to combine rigour and scholarship with humanity and craft in communicating these songs and tales to their audiences. The aim here (as with any good folktale) is to bring a touch of authenticity to proceedings, as well as to provide an alternative perspective to the purely academic. Bennett succeeds for the most part, and has a deft touch for describing the lost world of travelling minstrels, seasonal fairs and bothy gatherings, where ‘the night’s entertainment wove together tunes on melodeon, fiddle and “moothie” with ancient ballads, broadsides bought for a penny at a hiring fair, as well as hundreds of ephemeral songs, some composed collectively, scribbled on a scrap of paper that lit a pipe as soon as the song was ready to sing’ (149). In the end, what we have is a very handy and accessible introduction to the topic – and perhaps that is all a Companion-type volume needs to be. It seems to me, though, that with a little more judicious editing across the piece and the inclusion of a handful of well-chosen examples and extracts this could have become an indispensable guide to a fascinating and worthy subject – one that we are compelled to return to again and again, but which is never diminished by our attentions. 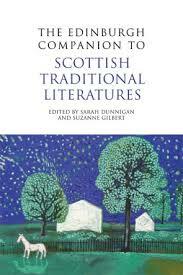 The Edinburgh Companion to Scottish Traditional Literatures edited by Sarah Dunnigan and Suzanne Gilbert is published by Edinburgh University Press, 2013. Tim Killick is the editor of Traditional Tales by Allan Cunningham (ASLS, 2012) and the author of British Short Fiction in the Early Nineteenth Century: The Rise of the Tale (Ashgate, 2008).